These my friends, are the best cinnamon rolls to ever exist on this earth. Ok, that may be a stretch, but it’s not far from the truth! Once we figured out the logistics of food for the holiday (because you know, food is the number one priority, lol), the how’s and where’s fell into place. An easy, laid back Christmas Eve is at our place and a laid back, Christmas Day (early) brunch is at my parents. My step-mom is doing eggs, bacon and waffles and asked me to do a “baked good” since there’s always some sort of bread baking in my oven. 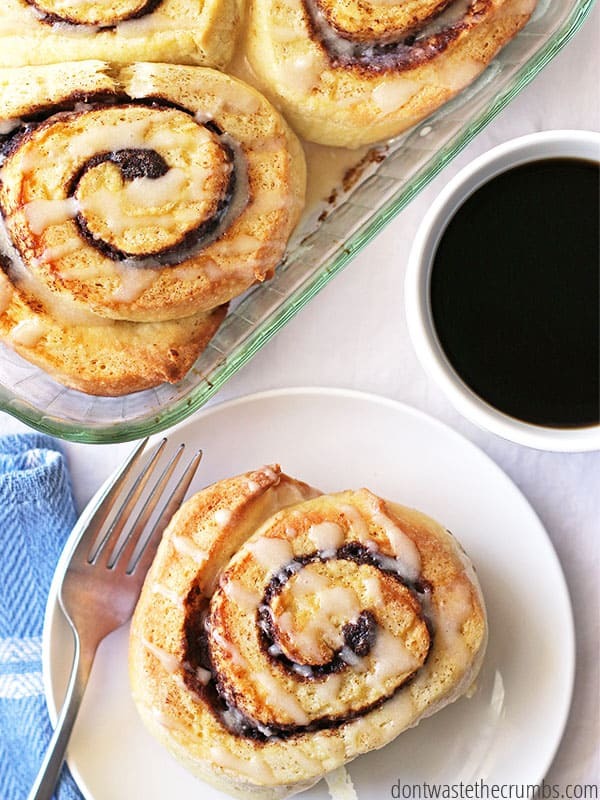 I decided to share two of my favorite breakfast splurges: biscotti and cinnamon rolls. But not just ANY biscotti and cinnamon rolls. This is in fact the best biscotti you will EVER have and I owe a million thanks to my sister-in-law who introduced this highly addicting treat to us a couple years ago (thanks Becca!). She first picked this 5-star recipe, and they really would have been awesome if she had stopped there. But oh no, she took it a step further. For half the batch, she added cocoa powder. Chocolate biscotti?! Oh my heaven. a double whammy chocolate biscotti with semi-sweet drizzle! Be still my beating heart! They are heaven indeed. And since they’re primarily bread that’s been toasted to remove moisture, you can easily make these a few days ahead of time and store them in a container until the big day (that is, if you can keep your hands off of them). 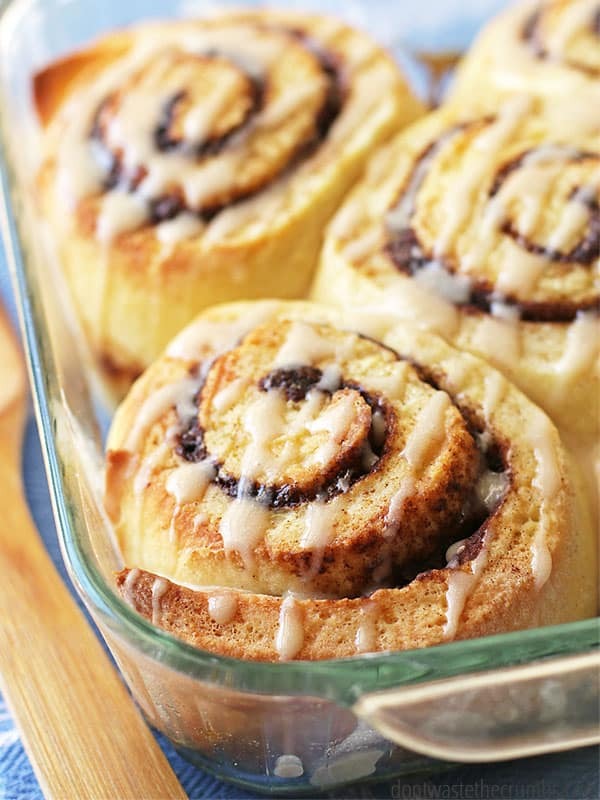 My cinnamon rolls are also quite possibly the best cinnamon rolls in existence. I can’t take full credit of course because my version is an altered version from a cookbook that was given to me a few years ago, but my minor changes take this recipe from really good to amazingly yummified. How’s that for an ego booster! Just a heads up – these do take some time to make, but they are well worth the effort. They’re also heavy in sugar and there’s not a speck of whole grain in site. That’s ok though if you’re only making these once a year. If I end up making a second time in 12 months, I’ll try making some healthier changes. The flip side is that because they rise slowly, in the fridge overnight, these too can be made ahead of time. Combine yeast and warm water in a bowl (either from a mixer or large free-standing bowl). Allow to bloom for 5 minutes, then whisk until smooth. Whisk in ½ cup flour and cover with a towel. Allow to sit in warm spot for 30 minutes. Add eggs, sugar, salt and remaining 4 cups of flour to the yeast mixture. Knead with a dough book on medium speed for 4 minutes, or until smooth if mixing by hand. Add room temperature butter and continue to knead for 10-12 minutes, or until dough is smooth. Add a little flour to reduce stickiness, if needed. Cover with a towel and let rise in a warm spot until doubled, approximately 2 hours. Butter a 9x13 inch baking dish. Transfer the dough to a floured surface and roll out into a 15x10 inch rectangle. Brush the rectangle with half of the melted butter, leaving a 2 inch wide strip unbrushed on one long side. Sprinkle the cinnamon sugar over the butter. Starting at the long side covered with sugar, roll up the rectangle snugly and pinch the seam together. With the seam facing down, cut dough into 10 equal pieces**. Place the pieces cut side up in the dish and brush the tops with the remaining butter. Cover with plastic wrap and let rise in the refrigerator overnight. The next morning, remove the cinnamon rolls from the refrigerator and let rise until half again as high, about 1 hour. Preheat the oven to 350 degrees. Bake until golden brown, about 30 minutes. Let cool in the pan for 15 minutes. 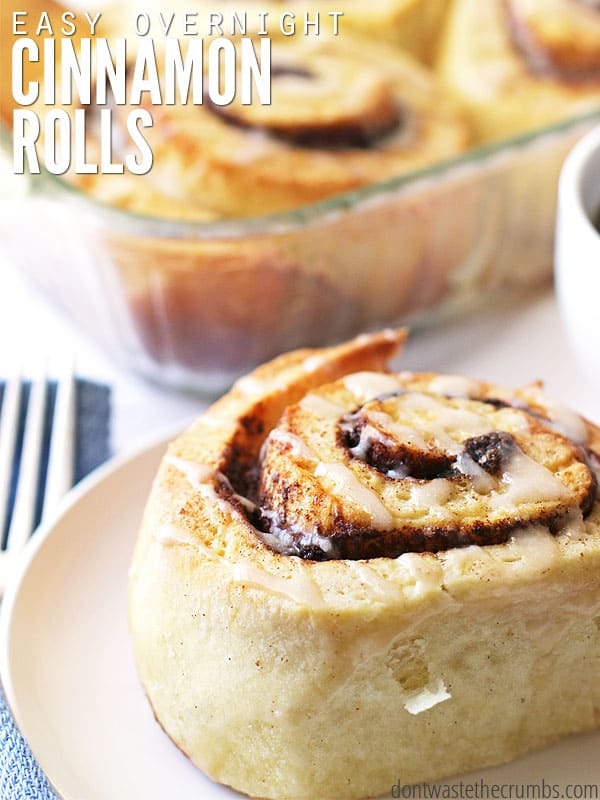 Spread optional glaze over the warm rolls and enjoy! 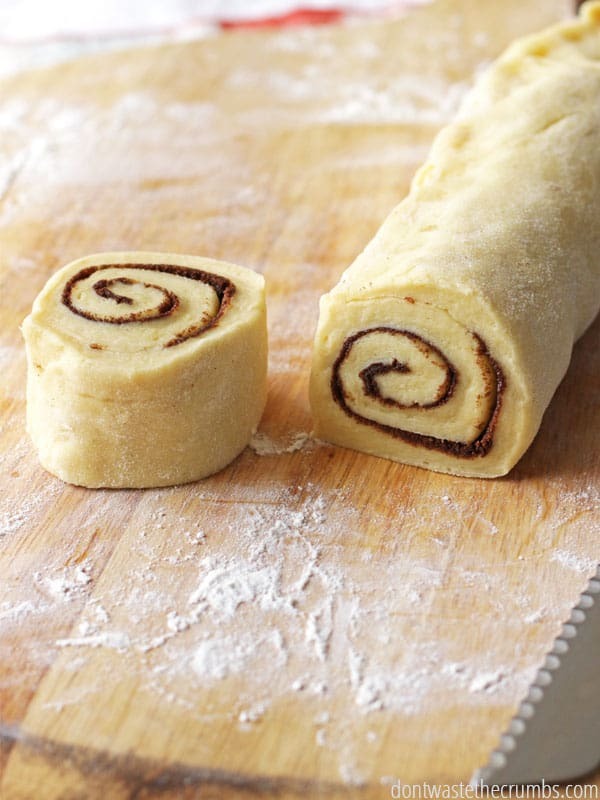 ** Dividing the dough into 10 rolls will make very large rolls in the end. Divide into 12 pieces to have a few more, yet still very ample, servings. Notice how big the half-batch is in the 8x8 glass pan above. *You can substitute whole wheat flour or spelt for some or all of the AP Flour. In a small bowl, sift sugar and salt. In a separate bowl, whisk butter, milk and vanilla. Stir into the sugar to form a smooth paste. Spread over warm cinnamon rolls. What’s your favorite brunch dish? Those look yummy. I will be making the same thing but a different recipe. We are also having upside down french toast with pears. I will be making homemade challah bread for that. My favorite time of the year is when I get to bake yummy stuff for everyone to enjoy. Ooh, french toast with pears sounds so decadent! That’s a good idea for some pancake toppings too! For the biscotti, how much cocoa powder do you add? Do you still keep in the cranberries and the nuts? It seems like a weird combo to me. I’ve had wonderful success freezing cinnamon buns. If you put the unbaked slices on a piece of parchment paper on a cookie sheet about an inch apart and freeze them for 1-2 hours, you can take out as many as you need the night before, leave them out on the counter and have them ready to right in the oven in the morning. Do the cinnamon rolls rise at all when you take them out the night before? Nice, I found this blog very useful for me, Great informative information. i made the cinnamon rolls for christmas morning, and they are THE BEST i’ve ever had! i may or may not have eaten 3 of them in one sitting 😉 thanks for this recipe! You’re most welcome Dannielle! I’m glad you and your family enjoyed them! Have you found a lighter or whole grain version yet? Also, do you think these will freeze? I’m looking for some recipes I can freeze and make for the kids before school breakfasts. Is there a way to modify the recipe to make it WHEAT and/or GLUTEN free? Hi Maricel! We’ve made these rolls with spelt, although that contains wheat. We haven’t attempted any other non-wheat grains so far though. If you do, please let us know how it goes! Ok, I think I’d still like to try the recipe with the spelt, before experimenting with a GF flour. How did you substitute for the spelt, would it be an even swap with the flour? Would you recommend sprouting the spelt berries before making it into flour? You can make a complete swap with the spelt. As for sprouting, that’s entirely up to you. If you have the time, I say go for it! I look forward to making these for Christmas this year! The only thing I don’t have is margarine. Is it okay to leave it out? Could I substitute something else? Thank you! Hi Anna! This recipe doesn’t use margarine – it uses real butter! And it’s definitely not something you can leave out or substitute for this go ’round. If you can, swing by the store for butter – you won’t regret it! What type of yeast do you use in this recipe?